Originally a small family manufacturing unit in the Rhone Valley, who gradually exploited its success to progress and grow, while at the same time developing its skills and technology. The business now relies on the third generation of the family and it’s enthusiastic teams using cutting-edge machinery and pratices. The brand is now popular in many European countries. Our strength is drawn from communication with all of our employees, partners, designers, creators and technicians which provide us with the impetus to create, innovate and pursue new avenues and designs. Each piece of furniture is designed firstly for its function in the bathroom, by whom and how it will be used, then for its form (design, material, colour, etc.) and finally for its components and technology (electrical opening, fitted drawers, etc.). A collection designed to integrate with the flow of modern times, focusing on design, ergonomics with a touch of fantasy, signature of the brand and its skill and expertise. All Ambiance Bain furniture is delivered assembled and fitted with the latest generation of runners and hinges incorporating built-in soft close features. The edges are applied using laser technology to ensure an impeccable quality finish. The high-quality raw materials are selected from the ranges of the very best European manufacturers and are subject to strict controls. The SMOTM Synthetic Resin worktops and showers are individually manufactured and benefit from special care during all phases of production in accordance with industrial best practices. Ambiance Bain undertakes to reduce its daily energy consumption, recycle its production waste, optimize its cutting plans and offcuts and contribute to the common goal of respecting the environment. We are particularly committed to selecting our raw materials and partners to ensure compliance with the applicable environmental standards (PEFC panels, REACH standard, etc.). But above all, our quality products are made to last, thus avoiding premature replacement and the accumulation of waste. 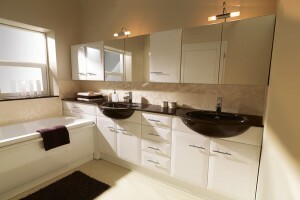 Ambiance Bain offer both Modular and Fitted bathrooms to suit every style, demand and budget. As Well as the traditional whites this fitted range comes in most of the native wood colours and styles. So if it is Linen Ash, Woven Oak, Wenge, Salonga, American Walnut, Malaga or Charcoal Oak the Native Range has your wood.